2009: Paul Rudd, associate director of Norwich City Football Club, was the guest speaker at the Norwich lunch for business people at the Maid’s Head Hotel on Thursday, June 25. Paul, a keen runner, has also been a coach and manager for various clubs – he even managed a successful ladies’ football team after his daughter (now at university) started playing football. Paul also works in the financial services sector in Norwich – he came to faith 15 months ago after walking into the King’s Church in Norwich at a time of great pressure. Several of his close friends were seriously ill, but after prayer have made remarkable recoveries. Paul’s inspiring 25-minute talk is one of a regular series of monthly lunchtime events organised by the Norwich chapter of the Full Gospel Business Men’s Fellowship held at the Maid’s Head in the centre of the city. The lunches (from 1-2pm) are aimed largely at people who work in the city and are designed to fit in a standard lunch hour with a half-hour meal followed by a talk. The cost to attend the lunch is £6 and all are welcome, say the organisers. Pictured above is Paul Rudd. 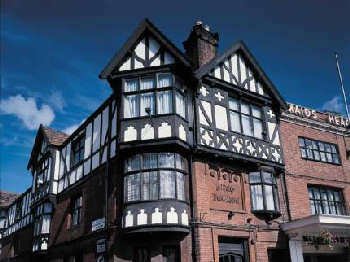 pictured right is the Maid's Head Hotel.